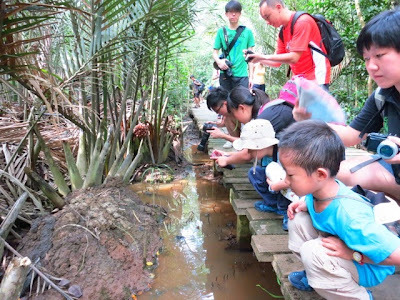 Here's some useful information about our Chek Jawa Boardwalk nature outings. 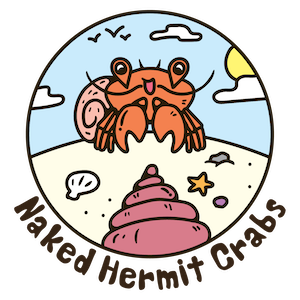 Naked Hermit Crabs is a small and informal group of volunteers who have been conducting free nature walks at Chek Jawa and Pasir Ris Mangroves since Sep 2007. We want to raise public awareness of the rich biodiversity and fragile coastal ecosystems found in these nature places. Even though we are not going down to the shore (yes, the nature walk is conducted on the boardwalk), there is still much to see and enjoy. There are monitor lizards, fiddler crabs, spiders, rare plants, wild boar, mudskippers and lots of fruit trees. 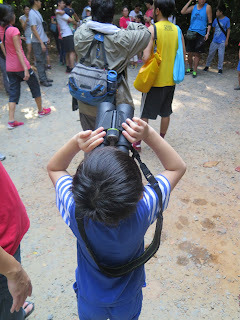 If we are lucky, we might even spot the Oriental Pied Hornbill, White-bellied Sea Eagle and the giant Atlas Moth. 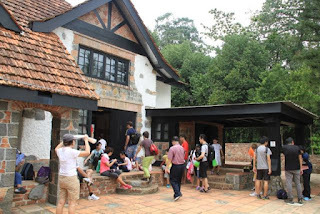 During these walks, we will meet and greet you at the Chek Jawa Information Kiosk. 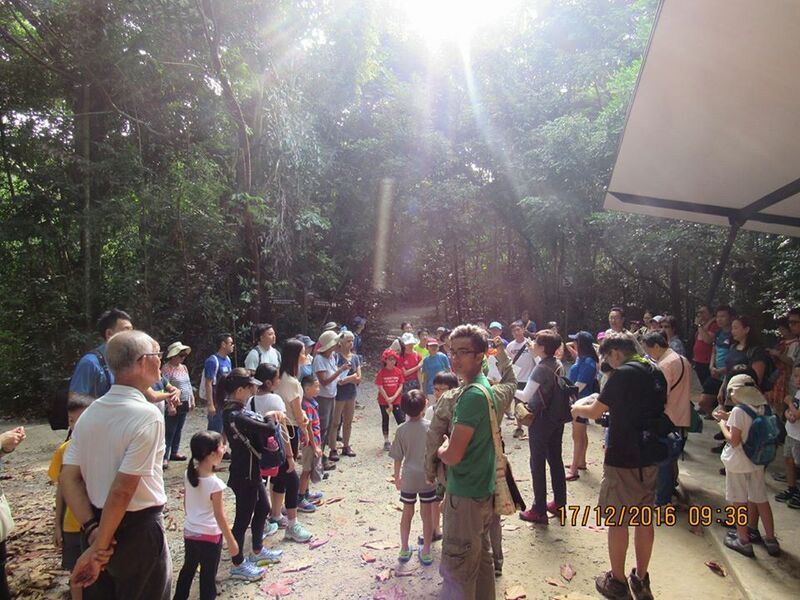 Our visitors are split into groups of around 10 to 20 people, led by a volunteer guide. Each group will proceed to explore the mangroves followed by the coastal area, before ending the walk at the English Cottage. We usually end the walk with a short drawing session to allow the kids (and grown-ups too) to express their thoughts about the trip. Some of you are keen to explore the greater area in Pulau Ubin. Click on the links to find out more about Chek Jawa, Pulau Ubin, how to get there, and what to see and do. 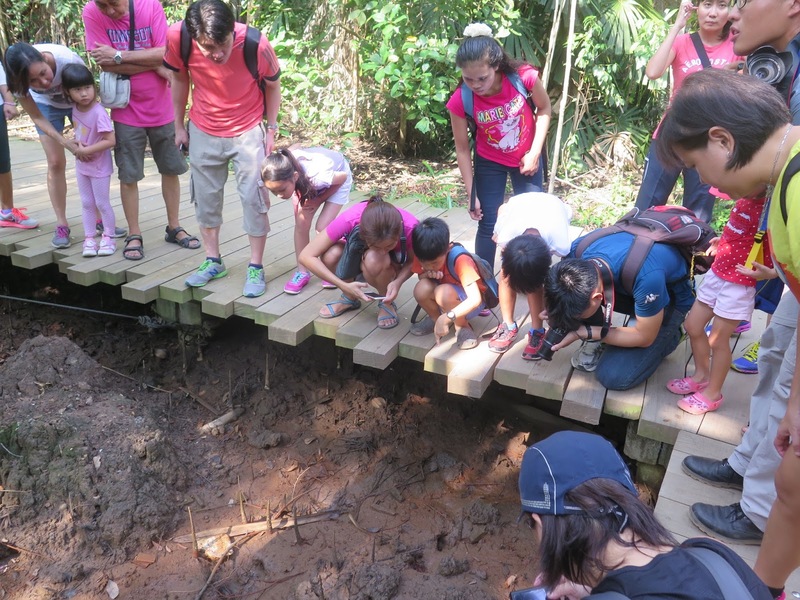 There is also a wealth of information in the NParks' website for Pulau Ubin and Chek Jawa, including maps, videos, tide tables and organised events. 1. At Changi Point Ferry Terminal, (Lorong Bekukong, Changi Village), catch the bumboat to Pulau Ubin. 2. At the Ubin Jetty, you will see many drivers and their taxis (vans) waiting for passengers. Tell the taxi driver to take you to Chek Jawa. 3. You will alight at Punai Hut. 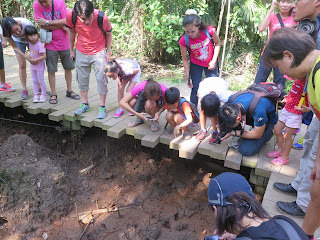 Chek Jawa is just a short walk from Punai Hut. Make sure you get the telephone number of the driver so that you can call him/her for the return trip. 4. We will be waiting for you at the Chek Jawa Information Kiosk. A: Drinking water (important), rain gear, hat/baseball cap. Optional: change of attire, camera, binoculars. 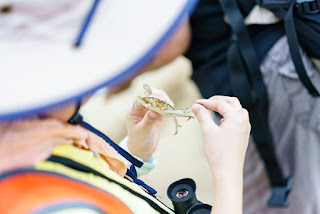 A: None as long as the participants are prepared to walk 2 km, climb a 6-storey high tower, able to tolerate the hot sun or wet weather, and be responsible for their own well-being during the walk. Q: How do I recognise the guides? 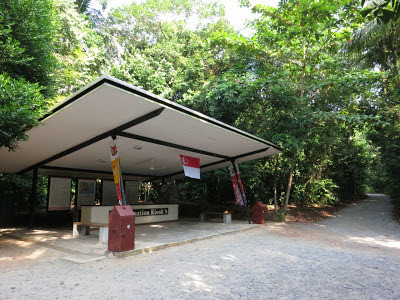 A: We will be the ones doing a roll-call at Chek Jawa Information Kiosk. 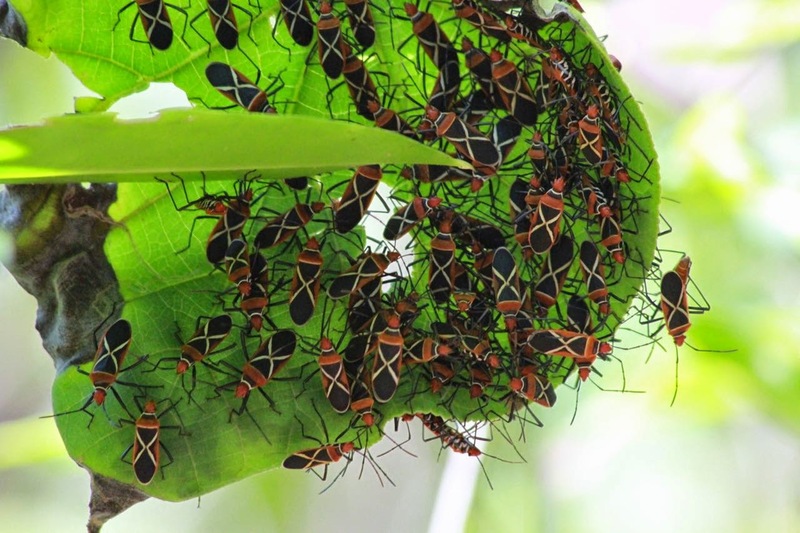 As long as you make it to Chek Jawa, you will definitely see us. A: This is a rain-or-shine event. 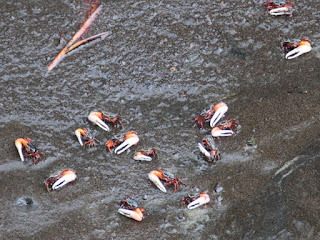 The Crabs will be there at Chek Jawa regardless of the weather. Usually we are able to resume the walk once the rain stops. Please come prepared with rainwear. You make your own decision whether to come or not in the event of bad weather. 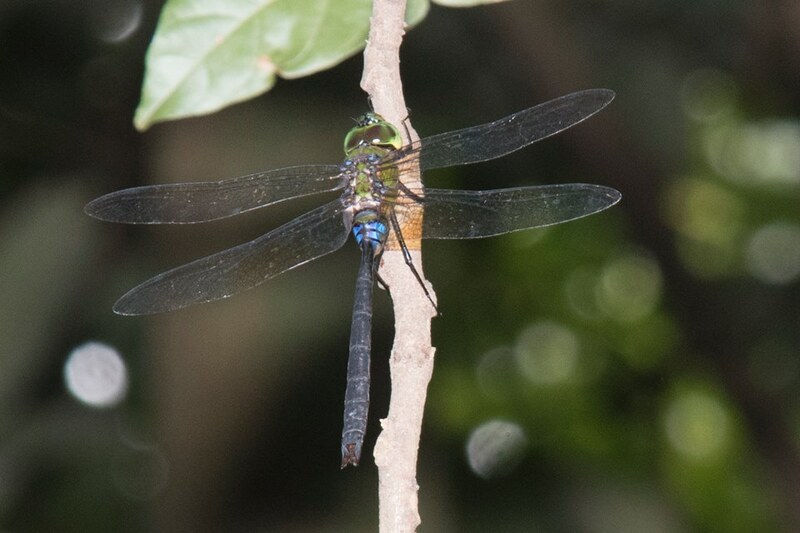 Enjoy some of the moments captured of our walks in these photos. 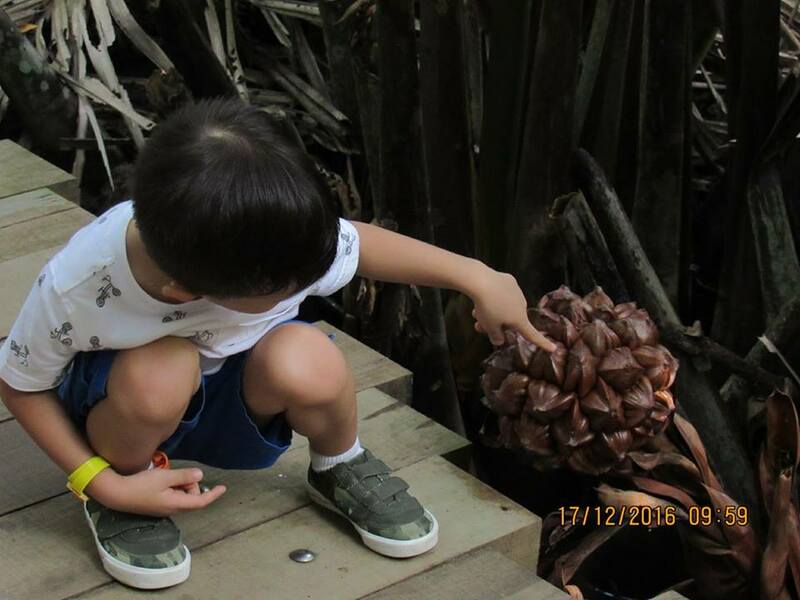 Ma, that's an attap fruit!